Above images are from the blogs I am highlighting in this post, please click the linked names below to see the original graphics. Today I thought I would share some of my favourite blogs to follow. I follow so many blogs, so it was kind of hard to narrow down. Because of that, I decided to go with two categories: long time favourites and new favourites. 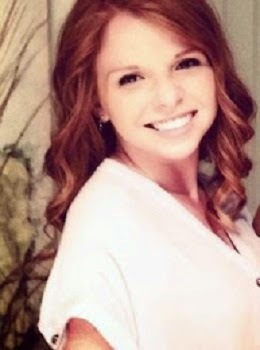 The College Prepster - I have been following Carly's blog for quite a while now! She wasn't one of the original blogs I found back when I decided to start my own blog, but it wasn't long after that. I have loved watching College Prep grow and expand and I have also loved reading along while Carly does the same. She and I finished university at the same time, so we have had a few major life events line up; at those times it was comforting and exciting to be able to read a blog written by someone at the same point in life as myself. 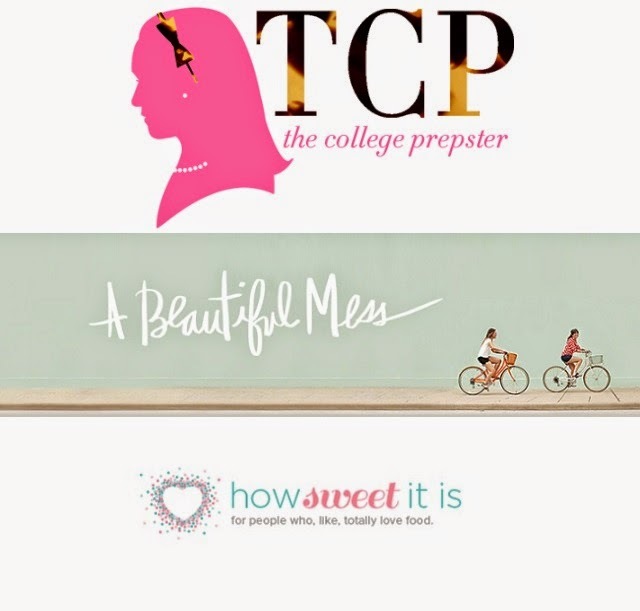 The College Prepster was started when Carly was in college, and has since evolved to sharing about her life living in New York and blogging full time. She has the cutest puppy, Teddy, and always has something new up her sleeve to share. A Beautiful Mess - I don't remember exactly when I stumbled upon A Beautiful Mess, but it was a long time ago when Elsie was still running her storefront, Red Velvet, and she was the only contributor to the blog (for the most part, I think?). A Beautiful Mess is a blog about home décor, arts & crafts, photography, fashion, and more. It has grown to a whole team that creates content and works behind the scenes and they are always surpassing their already great quality. How Sweet It Is - This is another blog that I don't totally remember when I first found it, but I am so happy that I did. I know it was pre-Pinterest days and I was still saving recipes I found on Evernote (did anyone else do that?). Jessica shares some awesome recipes with extremely drool-worthy pictures. I have tried quite a few of her recipes out myself and they have never failed me. IHeart Organizing - Out of these three "more recent" blogs, IHeart Organizing is the one that I have followed for the longest. I am absolutely obsessed with anything to do with organization and I went on a kick about 2 years ago searching for anything and everything online about organizing. I found my favourite YouTube Channel (which I'll share about soon!) and IHeart Organizing, among a few others, and I have been a consistent reader of IHeart Organizing ever since. I love following along with projects that Jen works on in her own home as well as the contributor posts she shares. History in High Heels - This is probably my most-viewed blog at the moment. Ashley is currently living in Florence working on her PhD in History and every time I read about her adventures my wanderlust is fueled even more. Even prior to her leaving for Florence, her fashion posts while living in Florida are so fun to read and she has such a great style of writing, which is no doubt enriched by her academic pursuits. If you check out her blog you'll probably see my name in the comments section of pretty much all of her recent posts - I'm fan-girling hard and I am totally okay with it. Summer Wind - Summer Wind is a blog that I have very recently come across, saying it was within the last six months would be generous. Sydney's posts are all well-thought out and well-written and I can't get over her awesome style. She has shared about some smaller (and not-so-small) adventures lately that are exactly my cup of tea! Make sure you check out these blogs and let these ladies know I sent you! Do you have any blogs to recommend to me? I am always happy to add another great blog to my favourites list! I also really love College Prepster and History in High Heels! People are so hard on Carly and I really don't understand why...I've been reading her blog for years and she seems like such a sweet girl to me. I love her blog! She seems super sweet to me too! A Beeautiful Mess is a favorite of mine as well. They have everything over there from DIY projects to recipes to decor tips. I just saw this post! You are too sweet. Thank you so much for following along and I always look forward to your comments!